At the end of October every year I start to get prepared for Christmas. I sit down and write a nice long list of all of the crafts I hope to make and all of the recipes I hope to bake and more often than not I don’t get anywhere close to finishing the list. BUT, this year I am pretty damn close! 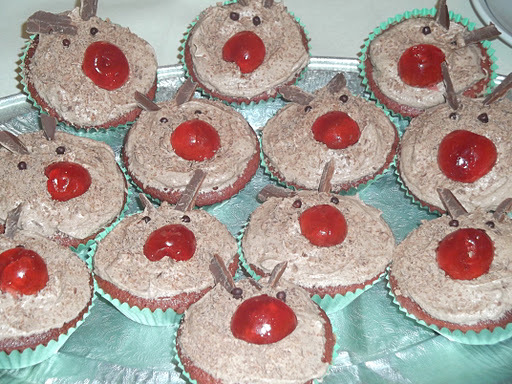 This recipe is one I’ve wanted to try for a while – Red Velvet Rudolph Cupcakes. 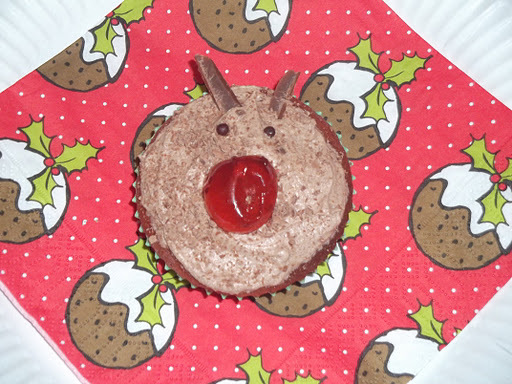 I liked the idea of having a “character” cupcake which looked like one of the key players in the Christmas story – Rudolph! Covered in chocolate and just darn cute to look at, they were so popular at my Grandad’s birthday/post-Carol Service Party that I’ve had requests to make more! Fortunately for me they are quick and easy, and unlike many recipes they don’t require any fancy ingredients – just store cupboard staples! 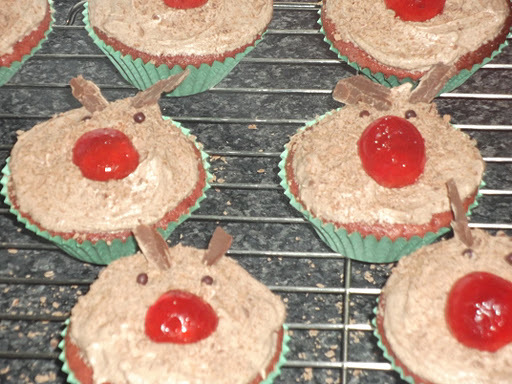 Red and Green Velvet Rudolf Cupcakes! Cream together the butter and the sugar until creamy and soft. Whisk together the butter and cream mix adding the eggs one at a time and beating until fully combined. Fold in the self raising flour and cocoa powder. Add in the red food dye and stir until the mixture is even. Spoon into cupcake cases and cook for 15 minutes in the centre of the oven until springy to the touch and a skewer poked into the centre of the cake comes out clean. Set the cakes to one side and allow to cool compeltely. Once cool. Cover with the chocolate buttercream. Place the chocolate balls as two eyes towards te top of the cake and half a glace cherry in the centre for rudolph's nose. Cut the flakes shorter to creae antlers and place at the top of the cake above the eyes. If you thought these Re Velvet Rudolph Cupcakes were fun then why not check out my Christmas Character Cupcakes featuring not just Rudolph but Santa Clause, Jack Frost and the all important Elves from the north pole in this post showing you how to create stunning Christmas Cupcakes using sugar paste.